Busy, busy, busy. Aren't we all?! This poor blog gets neglected over my other one, but the other one has been neglected too. 'Tis the season. But isn't it fun? My girl and I have been having fun getting our sewing on. Chewy started skating not too long ago. Figure skating. When I say "skating," people always ask "roller or figure." Roller skating is more popular in a land without water and ice. We're lucky enough to have a family member who lives by that is a figure skating coach. Chewy gets private lessons! I think one of the things that Chewy likes about skating is the outfits. She's the "fashionista" in the family. A very original fashionista. She's got a taste in clothes all her own. A polka dotted shirt with a striped skirt and neon tye-dye knee high socks is something she would wear. Fortunately, Chewy has gotten a handful of hand-me down skating outfits. But I also wanted to get her something. But I'm the thrifty type, so spending $40 on a skate skirt or $90 on a dress from the pro shop is not in my budget. Especially when she'll out grow the stuff in no time at all. She's growing like a weed! After some internet research, I discovered Jalie patterns. They have figure skating outfit patterns. Except I wasn't quite sure I could just jump into sewing a figure skating anything. 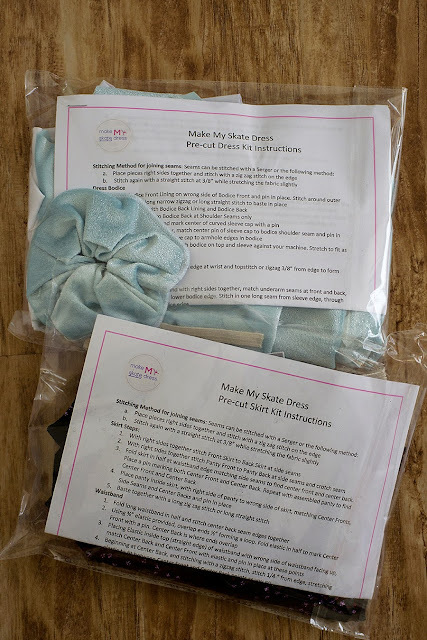 On the Jalie site I came across Makemyskatedress.com. Jack pot! A blog on sewing figure skating stuff, a store with fabrics, patterns, and pre-cut outfits, and help for crafting figure skating outfits! Just lovely! I know figure skating is only a small niche in the world, but you could even check it out if you have girls who like to wear pretty outfits! I ordered a pre-cut skating skirt in small and a pre-cut skating dress in small for my Chewy. They just fit her, so I'm guessing next year we'll be getting mediums! She's already excited at that! I have to admit, it's kinda addicting sewing these, once you get going. I might even venture out into pairing some of Make My Skate Dress's fabrics with the Jalie patterns. I'm just going to show the skirt first. The dress will get billing another time, once I can get some photos of Chewy in it. That shouldn't be too hard, considering she likes to wear it. The lighting just hasn't been great and I don't want to pull out my studio lighting to take a few photos. Everything was packaged nicely and cut nicely. Much better than I could do myself. Each piece is also labeled, so you know what it is. Totally worth it! Sorry that the photo isn't the best. Again, low light and I didn't put on my speedlight. Lazy Busy photographer homeschooling mom. The directions were easy to follow. I'm not an expert sewer, I wouldn't even call myself an intermediate sewer. I'm a basic sewer. With a basic sewing machine. Nothing fancy. 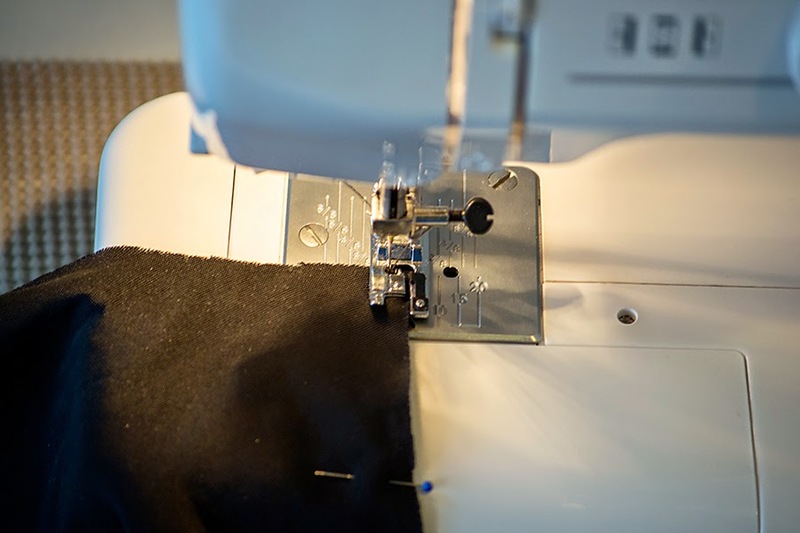 You don't need a serger, but an overcast foot is so helpful. It cost me about $7 for the foot for my Kenmore machine and makes zigzagging the edges of the fabric together a breeze. Stretch needles are worth it. I have ballpoint needles and I'm cursing/hating/mumbling not nice things under my breath every time I use them on stretchy fabric. The fabric bunches and doesn't go under my machine nicely. Then I read about stretch needles and decided to get some and try them. I love those things. Stretch material doesn't bunch anymore when I use those. I have broken a few, but that's par for the game with sewing. Use nice thread. Not the cheap stuff. My mom gave me that hint (thanks mom!). It doesn't shed as much, doesn't break as much, and doesn't muck up my machine like the cheap stuff. I've become an expert at cleaning and repairing my machine, unfortunately. The overcast foot on my machine. So pretty much....Chewy and I love Make My Skate Dress. It's affordable, easy, and just plain awesome. 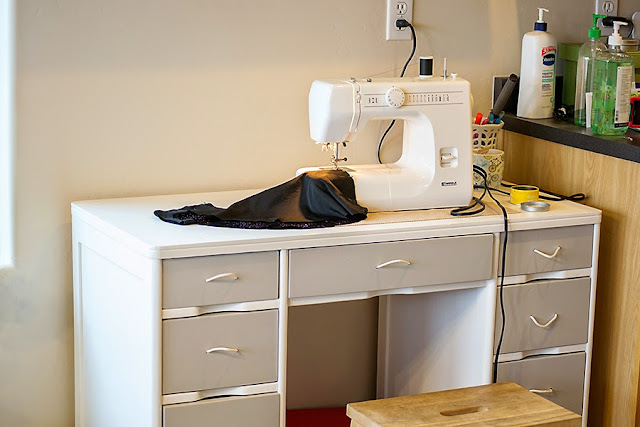 $10 to sew a skating skirt over paying $40! Yes, please! The material is all pre-cut, that is a huge time saver and made this project easy. Plus, it all came with a matching scrunchie for Chewy's hair. I grew up in the era of scrunchies and it's a time those things made a huge comeback. Love the scrunchie! I'm just sharing an exciting find with you....Make My Skate Dress. Awesome service, awesome shop, awesome place. I'm happy to share it with anyone willing to listen! And Chewy is happy to wear what we "create," so that's make me a happy mom. What exciting finds do you have to share?